Hello hello everyone! Good Morning! I have two very different cards to show you today using a common object. Let's see if you can guess what it is (psst... don't worry I'll tell you towards the end of the post)! 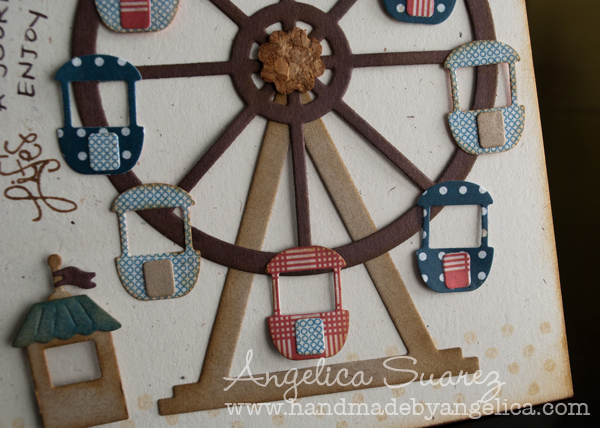 I knew exactly what I wanted to create when I started playing with the Ferris Wheel set - Vintage Country Fair! So, that's exactly what I did! I took some flecked cream cardstock as my base, because I love it (it's my favorite) and it always gives my cards that "eco" look I am drawn to. I decided I'd make a "wooden" ferris wheel using kraft cardstock as the base and dark chocolate cardstock for the wheel. Using just three different patterns, I made my little wheel seats and inked with "Brushed Corduroy" Distress Ink. I loved the idea of keeping a muted color scheme - it kind of reminded me of an old movie set. I used a thin piece of adhesive-backed cork for my center of the wheel. To create my sentiment - a compass would have been handy. Yes, like the ones we used in geometry class (yuck!). Funny thing is, I have one, but since I never had a use for it, I couldn't find it. Isn't that always how it goes? However, I was able to "wing it" and using the ferris wheel as my guide, I sketched a curved line in pencil and stamped the first part "Life's" from a set of stamps I designed using my own handwriting ("Fashionista" by Market Street Stamps). I then hand-wrote "a journey - enjoy the" and finished off the phrase with the word "ride" from the Ticket Booth set. 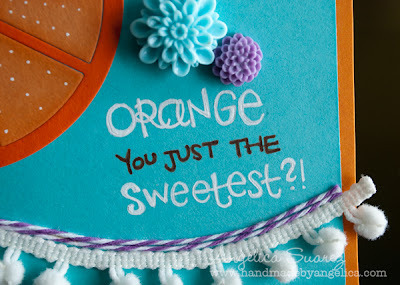 That's also where I found the polka dot stamp that I used on the bottom of my card. Loved that everything I needed was right in this release! So for the second card that I made....do you see what I see? And would you have ever guessed it's using the same Ferris Wheel? The versatility is awesome with these dies. I cut my "orange wedge" using two slightly different colors of orange and inked them up using my Dried Marigold Distress ink. I doodled in some dots to represent the lines in the sections and hand-drew the sentiment with the same white gel pen. The middle part of the sentiment is a Faber-Castell journaling pen. After adding in the two pretty sculpture flowers I added some Lilac bakers twine from The Twinery and some pom-pom trim from American Crafts to finish it up. What do you think? Hope you enjoyed today's post - don't forget you still have time to enter Lorie's Christmas in July Challenge! Head over there today and get your project entered before it's too late! I'll be posting a new challenge for you on Wednesday, August 3rd. Don't you love all of the cameos that are popping up all over Scrappyland? They are so romantic and feminine. 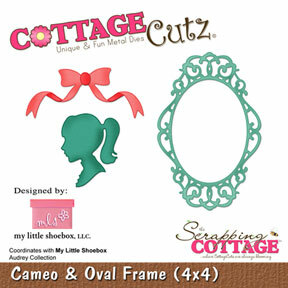 I was inspired by the Cameo and Oval Frame from CottageCutz to make this scalloped card. 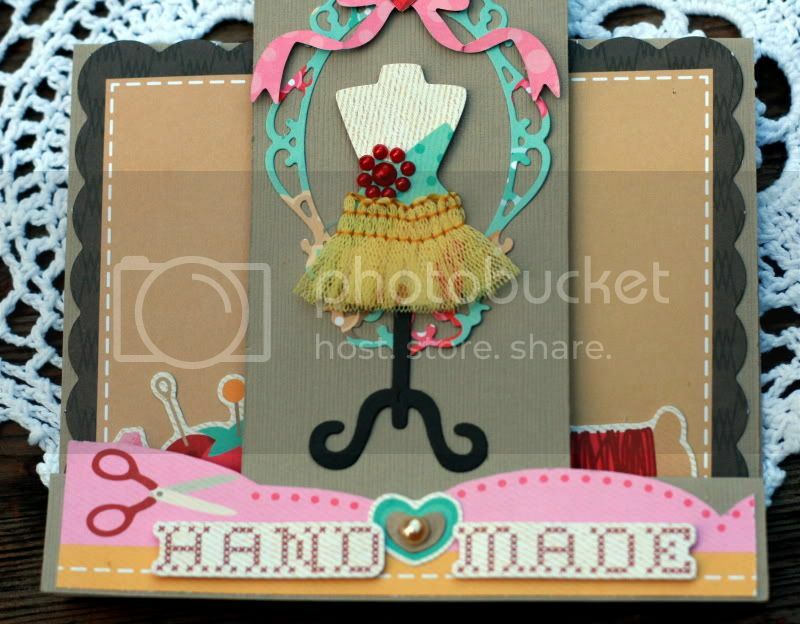 This is such a fun set to add some paper piecing. 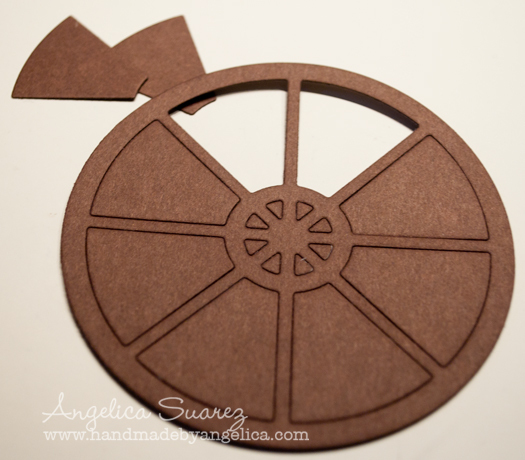 I cut two bows - one from patterned paper, and the other from cardstock to act as a shadow. and inked it with Distress ink, and shaped it. I added Crystal Lacquer to the buds and the center to add another texture. I love that this flower is the perfect size for cards and layouts. Good morning! Well at least it's still morning here for a little while. I'm babysitting my grandson, Max today, and he's kept me pretty busy this morning. Since he's enjoying a little tummy time, I've got time to get my post made for today. I'm back to the Flower Power release, mainly because I just can't stay away from all the wonderful flower dies. Especially at this time of year!! 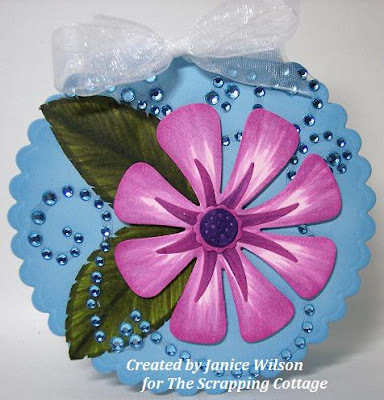 For my card today, I used the Plumeria & Leaves 4x4 die from The Scrapping Cottage. Those lacy looking cut out leaves are so pretty and add such interest. I decided to do this card in shades of ivory and yellow. I think that's such a subtle, but striking and elegant color palette, and I sure love the way it turned out. I hope you do, too!!! I have a stack of fun dies waiting for me to play with from the Carnival release, but I'm waiting on some more pictures and journaling from my daughters trip to Disneyland and California Adventure.......so I decided to show you this Prom layout I made with the CottageCutz Leafy Foliage 4x6 die. I love this die, it can be added to so many other dies or used alone to put that finishing touch on things. This die cuts out a leafy stem as well as some individual leaves. I inked the edges with some Peeled Paint Distress ink and adhered them to my layout. Very simple and adds just the right touch I was looking for. Hope you are enjoying all the talent from our new design team members - aren't they great?? Hello all!, This week I have made a card using dies from the new Cottage Cutz Carnival Collection. This is the cute Snack Cart, by pop dotting the cart you add dimension to the cart window and than bend the awning and you will add additional dimension.. I used the row of tickets from the Ticket Booth die like ribbon. I glued it under the square panel and flipped it over to create a loop and glued the other end down. 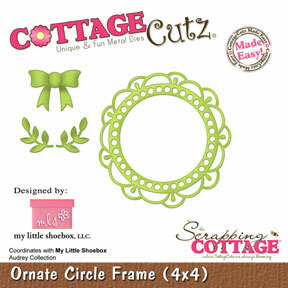 The Cottage Cutz Ticket Booth dies has 10 Clear stamp words so you can customize your tickets. 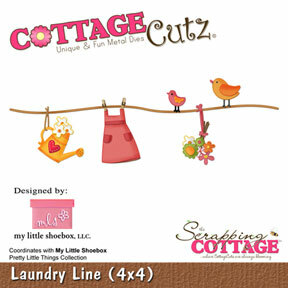 I added the Cottage Cutz Broadwalk Silhouette die as a background stripe on the card. Good morning friends! What a talented group of new DT members. I sure have been enjoying reading about them and seeing all their wonderful talent! So much inspiration already! 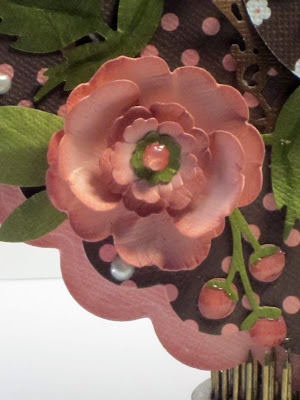 Today I have a few cards to show you, using several dies from the Flower Power Release. Doesn't this turtle make you smile? I love the little hat! So cute! The die is Groovy Turtle. I also used the Grass Border die, one I am sure I will be using often. For this card I used the Floral Doily. 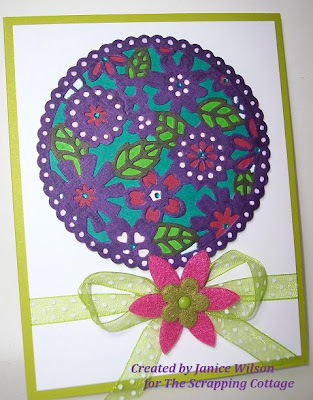 I used Copics and a white gel pen to color the doily and a few bits of bling to add some sparkle. 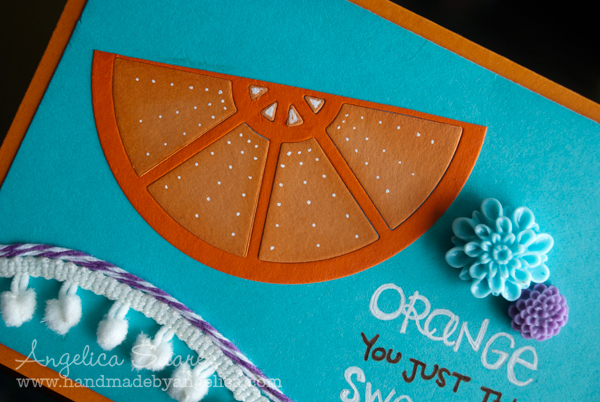 For my final card I used the Tropical Flower die. I made the leaves myself and added even more bling to make the design pop! Thanks for having a look! Please be sure and come back often for even more inspiration. Did you get a chance to watch Cheryl's video showing us how she dresses up the Dress Form from the Sewing Machine and Dress Form die? I love all the beautiful tags she has made with the dress form. Have a FANTASTIC week! 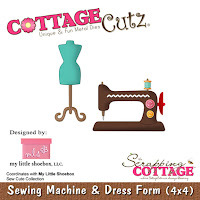 Hello everyone Cheryl here again with another post using the DARLING Cottage Cutz Sewing Machine and Dress form 4 x 4 die. 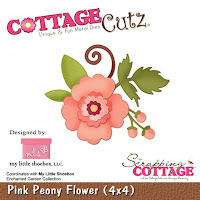 For my 1st tag I also used the Pink Peony 4 x 4 die cut for my flower and leaves. I decorated the dress form using vintage lace and trim. I used the button from the Sewing Notions 4 x 4 cottage cutz, and placed it on my bow at the top of my tag. For the skirt here I used some other vintage lace that I have, and then some vintage trim. 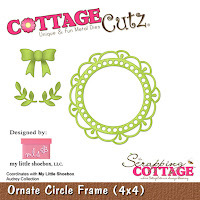 I added part of the ornate circle frames in 2 different colors to give a different look on the tag. Hello everyone I'm Cheryl, and I'm SEW excited to be part of The Scrapping Cottage DT! 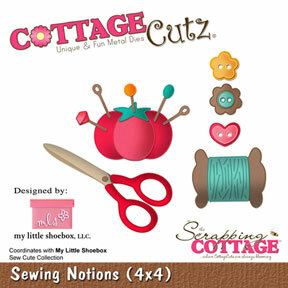 I LOVE working with these DARLING die cutz, they are all sew sweet!! I'm also honored to be working along side of such wonderful,talented designers! I just turned 41 this week, and I've been married for 21years to the best hubby in the world! He supports my crafting like no other, and also helps me whenever needed in my craft room. 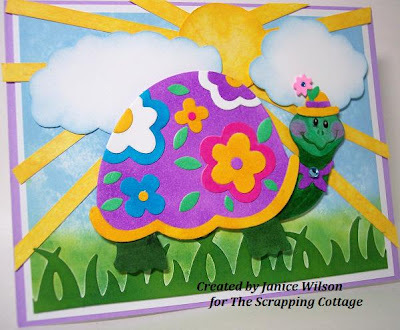 He has also designed a few cards for me as well, he is SEW SWEET!!! 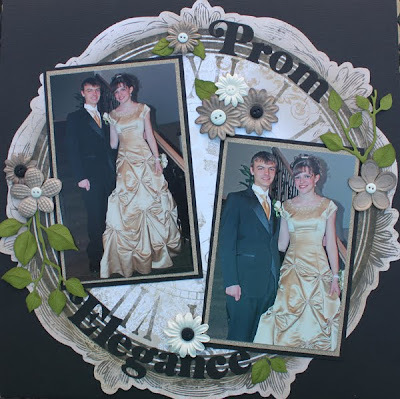 We have 3 children, 2 cats, and 1 little dog :) Ive been crafting since I was about 16 years old , I started scrapbooking in 1996 or shortly before my youngest was born. I then started card making in 2006 shortly after our move to Utah. 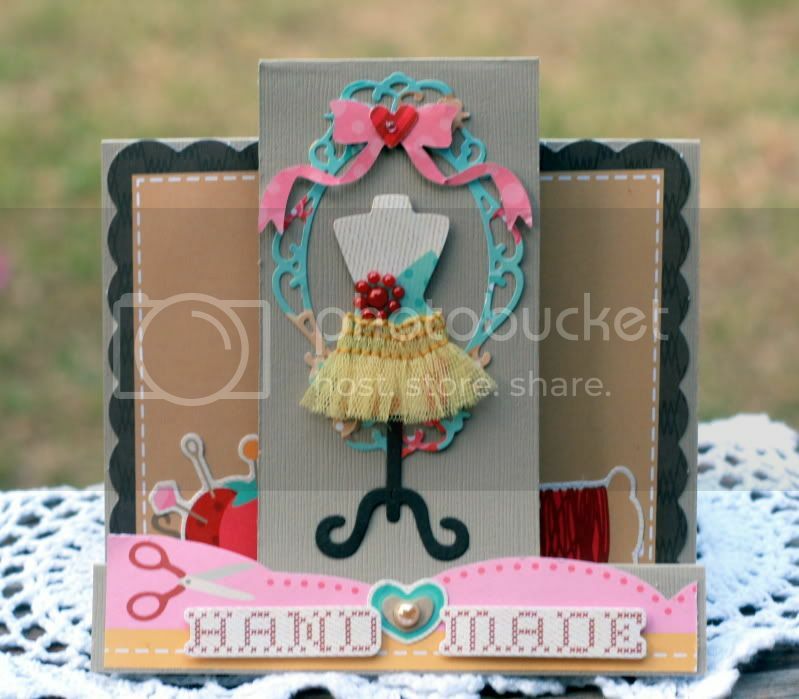 I have always LOVED crafting, no matter what kind its been :) Currently I design cards,layouts,mini albums,altered items, and so on :) Crafting is a LOVE, and Passion of mine, and its sew relaxing! 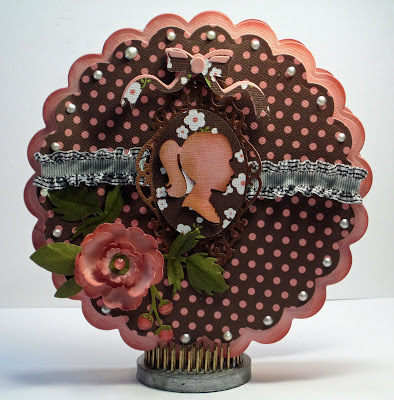 For my card I used the SWEET dress form dicut(LOVE THIS) and decorated it with vintage lace, and some trim. 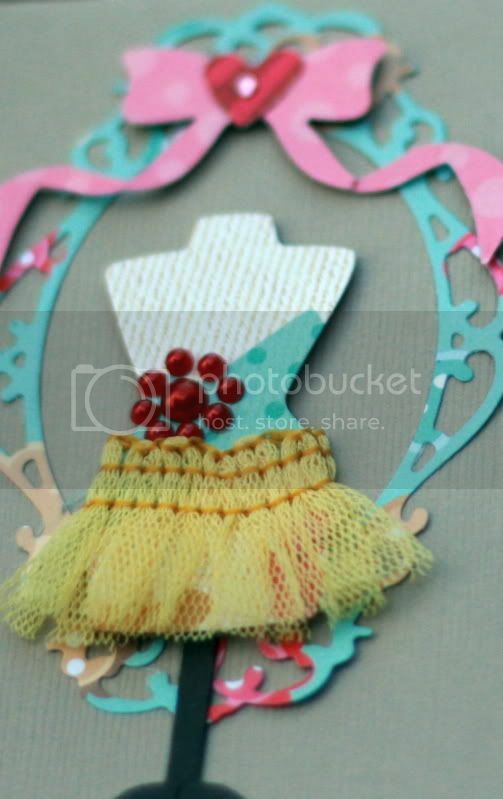 Ive also used the same dress form for my tag as well, only changing the stand a bit. The stand on my tag was distressed with ink, but everything else is the same. I also used the spool of thread for a tag to add some writing. Hehehehe I have to warn you that at the end of my video I didn't notice that I was adding the tulle to the backside of my dress form...hehehehe sorry!!! You will want to add it to the front :) Hugs to all!!! Thank you for looking and I hope you enjoyed todays post & video! I just got back from a scrapbook retreat where I was able to enjoy a few days away in the country scrapping my heart away. Now that I'm home and back to reality I had to put away all that stuff so I had room to create my post for today. There are lots of parts and pieces which give this die so much detail. 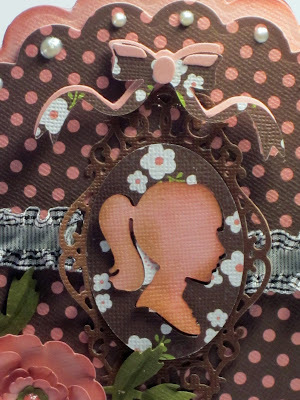 I used the MLS Sew Cute papers which are double sided, so I was able to use this pink dotted paper for my background. Hope you enjoy your Friday and get some scrappy time this weekend.